This is a review for the supplement Wellness Resources Super Brain Booster. The manufacturer claims that this supplement will improve memory, focus, mood, cognitive health and learning. Read on to learn more about the product and whether or not it is the ideal choice for you. Acetyl-L-Tyrosine – Works to increase cognitive function when stressed. Alpha GPC – Works to increase mental focus, memory and forming of brain cell membranes. Bacopa– Works to increase cognitive performance and memory. Also has a calming effect. It is recommended that one to two capsules be taken no more than three times a day. This product costs $36.00, but there is currently a sale of 25 percent off, making the cost $27.00 for a bottle. Each bottle contains 90 capsules, which is a 30-day supply. The manufacturer does not appear to offer a guarantee with the purchase of this product. This may be a concern for some who may not want to risk purchasing a product they may not be able to get a refund for if they are not satisfied. However, the lack of a guarantee does not mean that customers who are not satisfied can’t return the product for a full or partial refund. The website does not feature any customer reviews or testimonials, which may lead some to believe that this product does not work. This lack of reviews doesn’t necessarily mean that customers weren’t satisfied with the product. 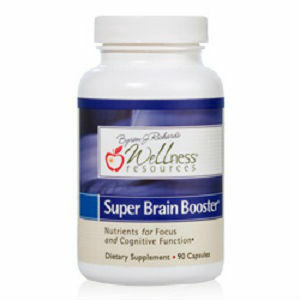 Wellness Resources Brain Booster is said to improve memory, focus, mood, cognitive health and learning. It is unclear as to whether or not this product has worked for customers who purchased it because there is a lack of customer reviews and testimonials on the manufacturer’s website. However, this doesn’t mean that any customer who has purchased this product has been dissatisfied. The price for the supplement is affordable for most and the manufacturer is currently offering a deal that decreases the cost by 25 percent. The price may be affordable, but there is no guarantee for the product, so there is a risk when purchasing it. Customers may want to purchase a product that they can return if they are not satisfied, but the manufacturer may not accept returns. The lack of a guarantee doesn’t mean that the product cannot be returned for a full or partial refund if a customer chooses to discontinue use. It is just a possibility. Overall, Wellness Resources Brain Booster seems like a good product and it may work for you depending on what you are looking for. Henry Costa	reviewed Wellness Resources Super Brain Booster	on June 15th	 and gave it a rating of 2.